Svaneti (Georgian: სვანეთი Svaneti) is a historic province in Georgia, in the northwestern part of the country. It is inhabited by the Svans, an ethnic subgroup of the Georgians. Surrounded by 3,000–5,000 meter (9840-16,400’) peaks, Svaneti is the highest inhabited area in the Caucasus. Four of the 10 highest peaks of the Caucasus are located in the region. The highest mountain in Georgia, Mount Shkhara at 5,193 meters (17,040’), is located in the province. The landscape of Svaneti is dominated by mountains that are separated by deep gorges. The forest zone is made up of tree species such as spruce, fir, beech, oak, and hornbeam. Other species less common but may still be found in some areas include chestnut, birch, maple, pine and box. The zone which extends from 1,800 meters to roughly about 3,000 meters (5,904–9,840’) above sea level consists of alpine meadows and grasslands. Eternal snows and glaciers take over areas that are over 3,000 meters (9,840’) above sea level. The region is notable for its glaciers and picturesque summits. Svaneti's signature peak is Mt. Ushba which towers over the Inguri Gorge and can be seen from many parts of the region. The climate of Svaneti is humid and is influenced by the air masses coming in from the Black Sea throughout the year. Average temperatures and precipitation vary considerably with elevation. The region is characterized by very heavy snowfall in the winter and avalanches are a frequent occurrence. Snow cover may reach 5 meters (16.4 feet) in some areas. In general, the lowest regions of Svaneti are characterized by long, warm summers and relatively cold and snowy winters. 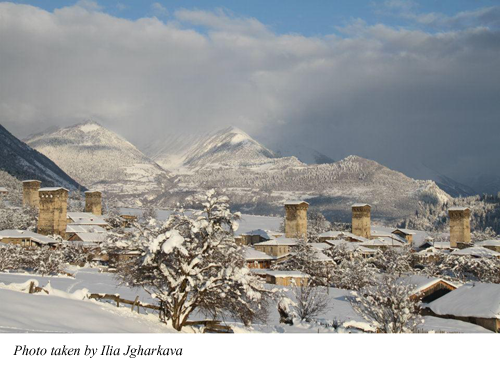 Svaneti is known for its architectural treasures and picturesque landscapes. The Botany of Svaneti is legendary among travelers. The famous Svanetian towers erected mainly in the 9th-12th centuries, make the region’s villages more attractive. Mestia is the main city of Svaneti, and contains the amazing History and Ethnography Museum, which houses a unique collection of icons, manuscripts and metalwork. It is a testament to Svaneti’s place as a sanctuary for the treasures of Georgia. Also worth visiting is the Margiani Family Dwelling Complex, which recreates what life was like in Svaneti for hundreds of years. The complex consists of a typical Svan house and watchtower. The tower, angled towards the slope of the nearby mountain so as to withstand avalanches and landslides, and the house with its dining room/cow shed, show just how dangerous and hard life was here.At 2200 meters (7,220’) above sea level, Ushguli is the highest permanently inhabited village in Europe, and an UNESCO World Heritage Site. The 45-kilometer road from Mestia is stunningly beautiful, with breathtaking views of Ushba and Shkhara, as well as the lovely villages of Kala and Ipari en route. Ushguli is a collection of four smaller villages, all of them made up of four or five story towers. There is superb hiking and climbing in the area, as well as possibilities for horse riding and mountain biking.